15th Apr 2010, 5:00 PM - Check back on Saturdays...? I agonized over this strip for a few minutes. 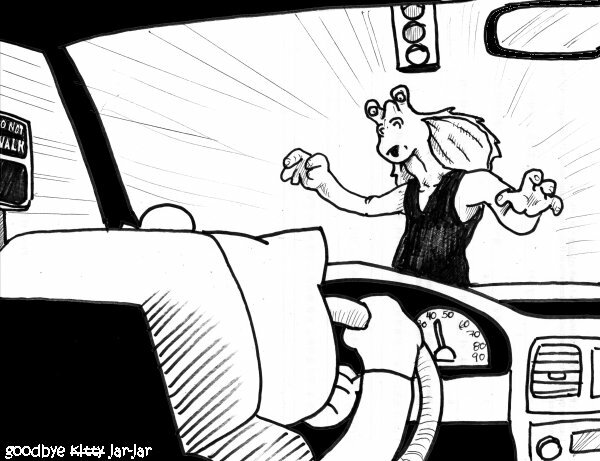 Which was more likely.... Kitty running a red light, or Jar-Jar crossing against the "do not walk" signal? Sorry about this week. I won't do it again. I think it's out of my system. Nevermind, I think that the Green light is indicated... For your theme this week, Jar Jar doing something stupid > Kitty doing something oblivious.